I buy lots of Geek Squad stuff (it’s less expensive than the “name brand” stuff). I guess I never paid much attention to their packaging before; I usually rip open the plastic and ditch it to concentrate on my purchase. 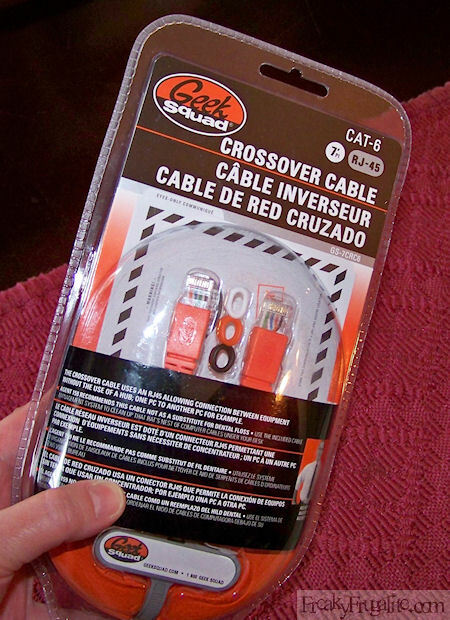 But I was in the car today, waiting for my sons, so in boredom I pulled out my new crossover cables and read the box. LOL!! These guys are funny! Dental floss?! :blink: I had to read it three times, to see if they were really serious or joking. LOL!!! While it is the same length, this 7′ crossover cable is not regulation issue for most competitive Manhattan Double Dutch Leagues. I’m going to have to start paying more attention to their packaging. This was funny! lol, interesting. I have not found them to be very useful in person, but it sounds like their products are good and filled with humor, which is a bonus. lol. They have to fill up all that space somehow! 😀 I am a label reader. Partly because I have to – stores I frequent get their goods from everywhere and so I have to read to figure out what the heck I’m buying – took me a long time to find sour cream locally, so we scoured the dairy aisles and eventually found “crème fraiche epaisse” – We don’t know French, but reading the ingredients we found a word that looked like ‘fermented’, and decided to take a chance. (It was sour cream! Yay! We can make burritos!) But also, I’ve learned that labels are a blast… usually a great source for bad translations, and for some reason, those never cease to amuse. Connie– you should take photos of the really hilarious ones!! I’ve heard these crazy texts are meant to make sure no one can sue them, after using it as dental floss! You’re right. I usually don’t think about it though. I should! It’s one of my greatest failures as an expat resource 😀 Some things just need to be recorded and shared! I still kick myself for not buying a toy I saw once. It was a masked Superman action figure on a black horse, waving a pistol and sword, with packaging that showed WWII era military scenes. The wording was fun too, things like “Super OK!” “Kids fine fun!” Why oh why did I pass by “G.I. Super-Lone-Ranger-Zorro-Man-Joe”?